The Events Calendar and Genesis Theme Framework by Studiopress can work very nicely together, but may require a little bit of customization. Depending on your site settings, you may need to add some snippets to get your calendar displaying how you would like. Unless otherwise stated these snippets should be added to your child theme's functions.php or through a custom plugin. In Genesis there is an archive setting which can cause the main event views to display only partial text and not the full view. To fix this, please add the following to your child theme's functions.php file. This snippet will force the main event views to display full content. If you have Content Archives settings set to Display Post Content and the limit is zero ( 0 ) the events will display without issue. If you add any number to that field, it will prevent the main event views from showing, but if you add the above snippet it will bypass that setting for the event views as well. The main event views of Month, List, Photo, Map, etc. are archives in WordPress, meaning there is no way to directly change layouts from the Admin. While Genesis allows you to change the default layout different pages, the event templates will only use your default layout. Your default layout may work for the single event template, but not your main event views. The following layout snippet helps you target Events templates and display the layout you want on your site. For all the layout snippets, you can change full-width-content with any of these other options or a custom layout: full-width-content, content-sidebar, sidebar-content, content-sidebar-sidebar, sidebar-sidebar-content, sidebar-content-sidebar. This first snippet will show the main event views at full width. This snippet will show all the event templates including the single templates at full width. This snippet will show the single event templates at full width. 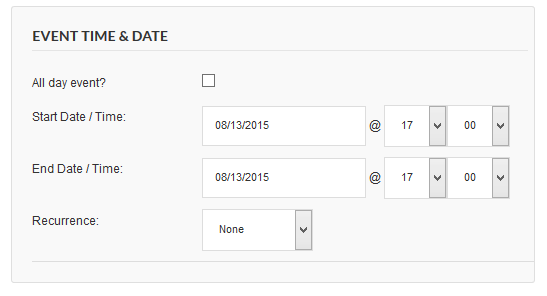 This is an alternative snippet that will also show the single event template at full width, provided by Hans! This last layout snippet will show the Community Event's templates at full width. All the layout snippets can be used in any combination to target specific event templates and get the layout you would like for each. for different hooks if you would like to place it somewhere else on the single event template. If you have the Author Box activated in the Genesis settings, it will show on all the single templates including the Events Calendars. The Filter Bar does not stay open on mobile devices using Genesis due to the open process causing a script to think a resize has taken place, which then causes the Filter Bar to close. We hope you found this tutorial helpful! Have questions or issues with Genesis compatibility? Hit us up at our help desk and we’d be happy to help.